Sie Medway-Smith had told me about Pablo Clements’ synth haven of a studio, Toy Rooms, so I went looking for it on Miloco’s website. 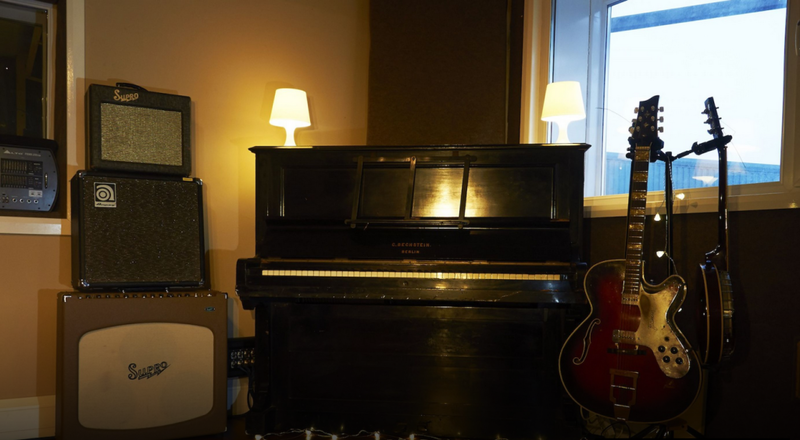 Covered with synths, keyboards, guitars, drums, and vinyl records, it’s quite the hidden gem of a studio, located in an unassuming spot in Brighton. Shared by Pablo and James Griffiths, it provided me with a lot of inspiration for asking questions in our interview, which you can read below. Hi Pablo. Tell me a bit about your beginnings and early career. I started making music about 22 years ago, by using an Amiga computer and sampling old records. I moved to London around the same time, and met people like Tim Goldsworthy and K.U.D.O from Major Force, who I started to work with. By borrowing K.U.D.O’s MPC60, I was able to take what I’d learned on the Amiga to the next level, and ending up making music with an ADAT, the MPC60 and a turntable. I signed to Mo’ Wax with my first band, called the Psyconauts. 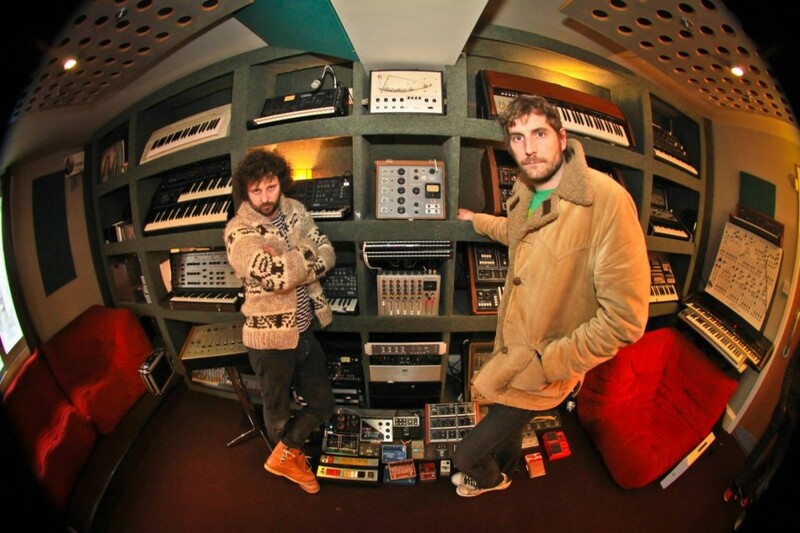 Most of the first Psyconauts’ album was made on an MPC2000 and an ADAT machine. Because Tim and K.U.D.O were using Logic, I started learning how to use that as well. Making sample-based music used to be about finding the records no-one else had, I come from a world where you find the most obscure ones to sample from. Hip-hop would later introduced me to records that I could use for that. I’m assuming that seminal artists from the early 90s, like Massive Attack, were an influence, right? Yeah. I come Yeovil, which is 35 miles from Bristol. We used to pick up the Bristol radio stations in our cars, and all the guys from Massive Attack, then called The Wild Bunch, would be playing on there. Hearing the new Wild Bunch record was almost as important as hearing the new Digital Underground records for us. There was a lot of good stuff coming out around that time. What most bedroom musicians do now is very different from the sampling culture of the 90s that you’re from. People prefer to use sample packs now, rather than vinyl. Yeah, but my mind is still in that place though. I’m from the same school of music as people like DJ Shadow and DJ Format. We have rules: if it’s been sampled, you don’t sample it. So as soon as it’s on a sample pack, I’m not really interested. I’m friends with a guy called Juliano, who runs RecordKingz, and he’s a huge break dealer that keeps me in the loop on interesting sounds and samples. For me, you can track a band playing music live, and it could sound a bit sterile. But then you might find an old drum machine loop and stick it under the live recording, and it’ll sound great. 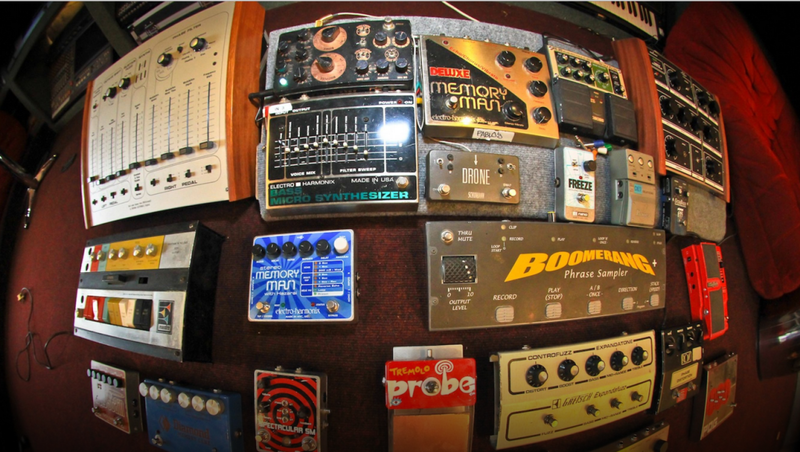 You’ve got a lot of analog here in your studio. Do you prefer to stay in this realm, rather than go exclusively digital? For me, it’s easy to sound good with analog stuff. Arca was here the other day, and I listened to what he’d made in Ableton. He’s never used a real synth in his life, and I was still blown away by what he played me. Some of the sounds he makes are mind-blowing. He makes it sound analog. There are loads of kids like that today, like James Holden . He’s moved on to using modular synths now, but when I met him he was all in Reaktor, and I was like,”Really?“. I’d rather just use the real thing. The EMS Synthi was used by K.U.D.O, and I’m a big fan of Brian Eno’s production, as well as Roxy Music’s, all of which was done with the Synthi. Cool. I can see how that has influenced your studio setup. So how did Toy Rooms come about? This floor was built on a wooden foundation, and we’ve got a bunch of poles that hold the place up and prevent it from collapsing; you can’t build a brick wall on a wooden floor, so we needed the poles. My advice to anyone building a studio is to build on concrete. However, our rooms sound good. 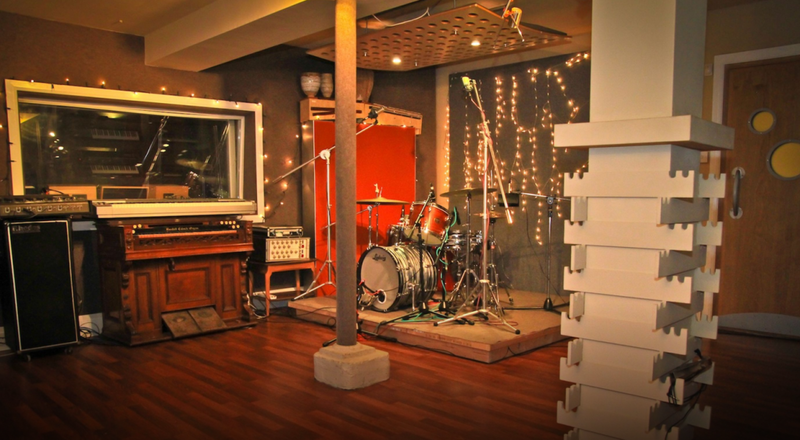 The live room is great for drums, and gives us a nice, close sound. The live room is split up so a band can jam, but have their own monitoring system. We have the guitar and bass cabs in another part of the building, so the band can play live, and you can record them like that, which is what I’m used to. You can’t beat a band playing together if you want to capture the feel of the music. 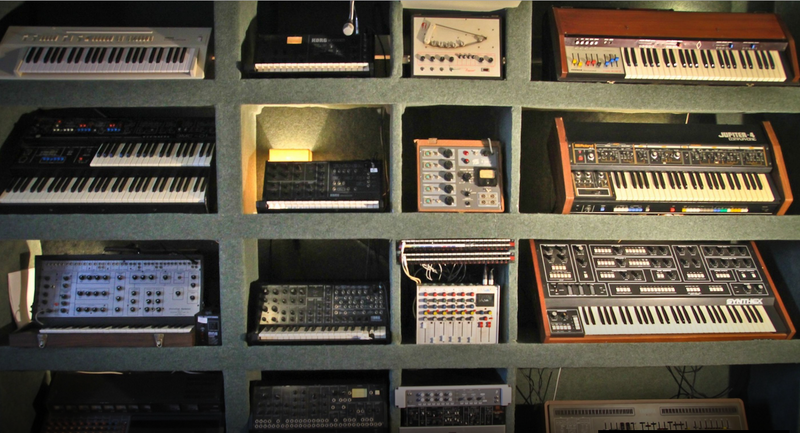 How were you able to amass such a massive synth collection?. I’ve counted 20+ synths in the control room alone. I started early. I was buying synths way before they became cool. I bought my Jupiter 4 for £300, and got the Yamaha CS-50 for £270. Almost every synth I’ve bought cost less than half of what I could sell it for today. When people look at the collection, might think “Wow, you’re a millionaire“. Not really. It’s just about being smart about how you buy and sell them. The EML ElectroComp 101 has been used on almost everything we’ve done in the last two years, because it sounds amazing. The Elektron Analog Four is wicked. We just got Ken Macbeth’s Elements synth, which is unbelievable. If anybody has enough money to spend on a high-end synth, I’d say say buy that. We’re the fourth studio to have one, which is exciting. 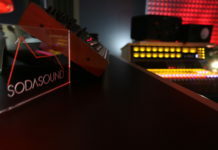 We have some modular stuff here too, but that can be misleading in terms of cost, because you initially assume that buying only one module will be cheap, but then you find out that the whole point is to expand your setup with additional modules and rack gear. Modular synths sound great, and if you don’t work with deadlines, you can dive into it. I love the happy mistakes you can make with it. However, keep in mind that synths break down a lot, like our Jupiter 4, for example. Make sure you have a good repair guy if you’re buying vintage synths. I see that you have a lot of keyboards too in your live room. We have two pianos. One’s a Beckstein, which is heavy, and better for rock and roll. It’s not very velocity sensitive though. Our other one is good for that, though it’s not as gnarly. I forget what it’s called. We have a Wurlitzer too. We’ve got five kits in the hallways, but the one we have in the live room at the moment is a remake of the kit Ringo used in The Beatles. It’s a Ludwig kit, with a tight kick. We have an AKG D12 mic on the kick, a Coles mic as an overhead, an SM57 on the snare, and a Neumann 87 as a room mic. 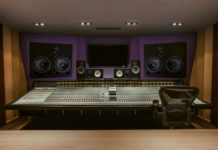 What kind of recording console are you guys using? It’s a Calrec Q-series. They’re made by the same engineers that make Neve consoles. Calrecs were made for broadcast though. Mine was in the BBC’s studios in Wells, and even had a button on it that was hard-wired to Big Ben. The faders had to be inverted though, because the faders on a broadcast desk go from up to down, instead of the reverse. Supposedly, the reason for that is when old radio guys used to work late shifts, and they’d fall asleep, slumped over the console, and inadvertently push the faders up with their forearms. So instead of knocking people’s ears out with the excessive volume, they preferred to have it go silent instead (laughs). So we had to have them turned around, and redo the patch cords. 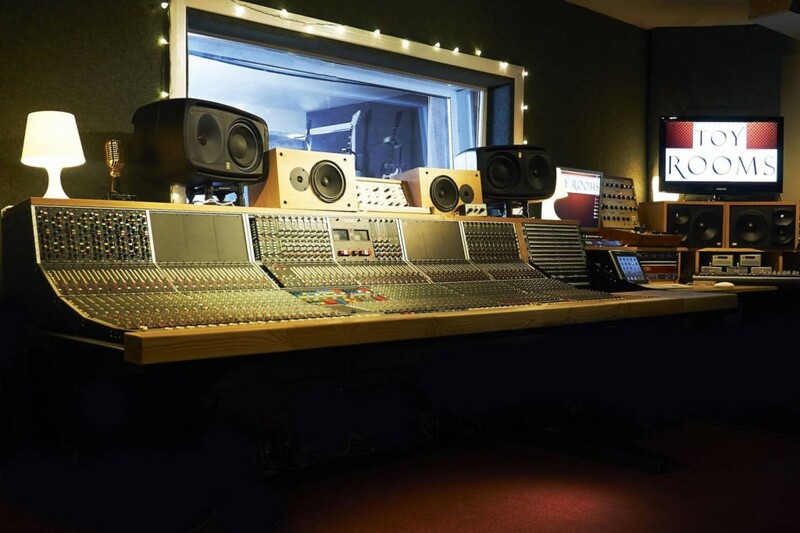 Why not get an SSL or Neve desk, which is the status quo among most studio owners? Because this is as good as any of them. Neves can’t be switched off. So you’re looking at ££50,000 a year in electricity bills. And I’m not a fan of SSLs; they can be hard to work with because they’re so clean and clinical. Calrec is clean too, but you get more value for your money, with 32 built-in compressors, and 60 channels. The engineer who installed it for us rates it over any SSL. Our test for it was to turn on all our synths and feed them into a channel. The desk doesn’t turn it into mush. With old desks, you’d run five synths through them, and it starts to fart and sound awful. Not this one. The headroom on it is huge. The synths we work with are pretty dirty, so having this kind of desk on the back-end is helpful. I see that have the Munro Egg Monitors, instead of the Event Opals that were here before. Yeah, we’ve just got them. They’re quite bright, but very good for the money you spend. The Event Opals didn’t work very well in our current room. We have a pair of KRK’s too. Let’s go through the synths you guys have here. Can you tell me about them? Sure. I have the Macbeth M5N. It’s a influenced by the Moog Modular 55 and the ARP 2600. It’s a semi-modular synth, but when you pull all the cables out, it still works. You can patch things in to change the routing of signals, and you don’t need to know everything about synthesis and modular science to use it, as opposed to a purely modular synth, which you can’t operate without that kind of knowledge. We’ve got Ken Macbeth’s Elements, which I mentioned. It’s kind of a cross between the M5N and the EMS, and has a digital delay and spring reverb built into it. The Yamaha CS-80 is Vangelis’ Blade Runner synth. It’s hard to fit it into our mixes though. It’s one of those synths that sounds amazing when you switch it on and play it. But you need to start with it. Because our sound gets so dirty, the CS-80 doesn’t always fit what we do. I have an Oberheim Polyphonic, one of the first polyphonic synths. When you press one key, it plays a different key, and you have to tune all the keys to each other. It’s complicated, trust me. I’ve tried explaining it to people….but the sound is amazing. The serial number on it is 001, and supposedly it was made for Stevie Wonder. I can’t be 100% sure, but I’d like to think it was (laughs). We have the Elka Synthex, which we don’t use that much, but are starting to like more and more, It’s a very electro/industrial-sounding synth. A lot of German acts use it, and it’s most famously known for being on Jean Michelle Jarre’s “Oxygène“. There’s also the Farfisa SyntOrchestra. It has a very fizzy sound, and it’s the only synth Farfisa made. We have the Korg MS20 Mini, which everyone knows about. The Roland System 100 is another one we have, with the 101 synth and 102 expander. Our favorite synth here is the EML ElectroComp. It’s based on 3 oscillators, similar to a Minimoog, but sounds more like an EMS Synthi. We have a polyphonic Korg MS-20. It has a resonator filter with a massive stage that no other synth has. There’s also the Yamaha CS-30, which has a sequencer built in. It goes mental if you use the sequencer and LFO together, at high speeds. Feed that into a Memory Man delay, and you can get amazing effect sounds. Why do you think digital synths often fall short in creating the kind of life that analog ones have? Because they’re all in tune, and they have too many presets. Half the job of making a sound is constructing it yourself. We’re scoring a movie right now, and I already know that I’m going to turn to the M5N for a certain bass sound that I need. We already know that the sound’s going to have some fizzle to it, which will probably drive some orchestra person mad because it’s a little out of tune (laughs). With that being said, digital synths are getting better though. I really like the new U-He Bazille. I thought the FXpansion Synth Squad was really good, and had a good air to them. I like Omnisphere too, as well as iZotope Iris. Are there any synths that you’d recommend for people on a budget that are looking to transition from the digital world to the analog one? The Arturia Minibrute is great. Alternatively, if you can afford it, an MS-20 with a Memory Man will give you a lot. The MS-20 is a great synth to learn from. When you turn on certain synths, they start going “wub wub wub” and don’t stop for half a day. You don’t want to start with any of that stuff. The MS-20 is great as a starter synth. Thanks for having me over Pablo. Anything coming up for you this year that you wanna talk about? We’re scoring a big Hollywood movie that I can’t name, but it should be coming out later this year. We have a remix EP of our own music coming out on our label, with remixes from the likes of Trentemøller, Nick Cave and Warren Ellis. They’ve all done reworks of our tunes, which will be coming out within the next two months or so. Our label, UnderScore Collective, will be releasing numerous artists like Joel Wells, plus some of our film-scores. I’m looking forward to it.